Play the Big Game with Delta Force Paintball! 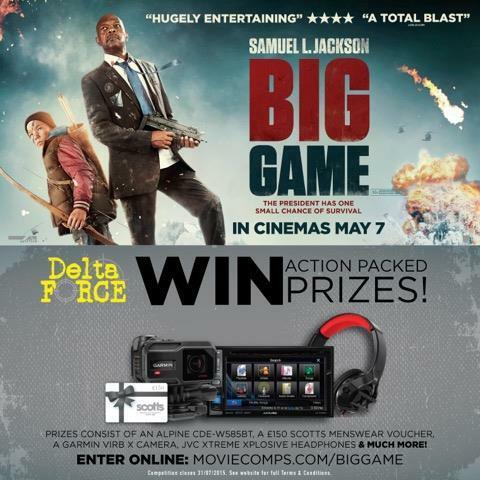 To celebrate the release of Big Game – in cinemas Thursday 7th May – Delta Force Paintball is giving you the chance to win an action-packed day of paintball for you and four friends at one of our award-winning paintball centres, as well as a Garmin Virb X Camera, JVC Xtreme Xplosive Headphones, a £150 Scotts Voucher and MUCH, MUCH more! Big Game – starring Samuel L Jackson and Onni Tommila – follows the journey of the US President (Jackson) and his unlikely 13-year-old ally Oskari (Tommila) as they heroically battle their way through the Finnish Countryside to escape terrorists who shot down Air Force One – the official Presidential plane. Armed with just a bow and arrow, Oskari must use his local knowhow to protect the President as they make their way through the unforgiving Nordic terrain. The pair will encounter many life-threatening situations along the way, but can they survive? Want to put yourself in Samuel L Jackson’s shoes? Then you’ll love our Delta Force Paintball Centres! With epic Hollywood inspired movie set paintball game zones such as Jet Hijack, White House and London Apocalypse you’ll feel like you’re starring in your own silver screen blockbuster!